Hot Ink is based on the theme of tattoos. 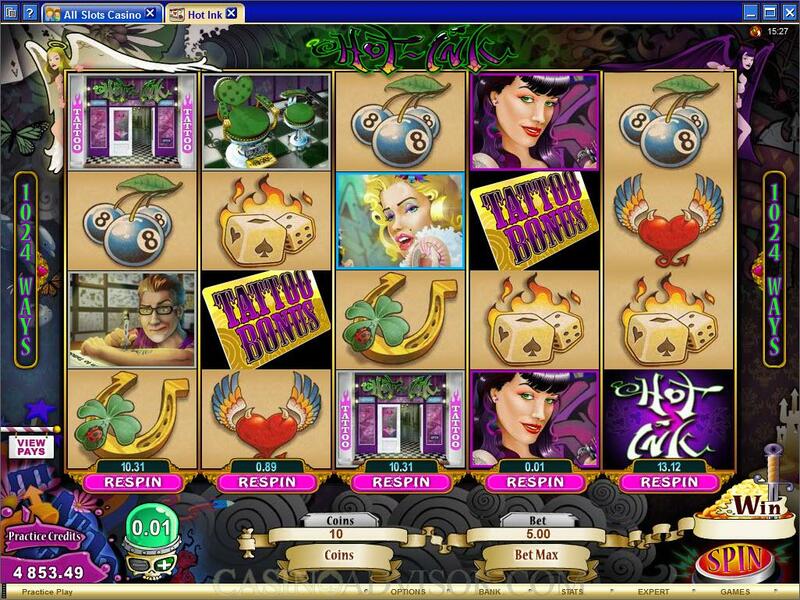 Tattoos are very popular and the theme is well captured by the slot game. The main symbols are taken from a tattoo parlor. These include the Parlor, the Chair on which the tattoos are inked and the Man inking the tattoos. He has two female assistants, Angel and Luci. Both of them independently offer payouts, but also offer mixed payouts when either of them appear from left to right. There are five tattoo designs as symbols. They include popular designs like Flaming Dice and Winged Heart. The heart has the devils horns and tail, which again emphasizes the mix of good and evil. The other tattoo symbols are Star, Horseshoe and Cherries. Hot Ink has three special symbols. The Hot Ink Logo is the wild symbol. The Tattoo Logo triggers the Tattoo Bonus. The Fish symbol triggers the free spins. The Tattoo Logo and Fish symbols are scatter symbols. 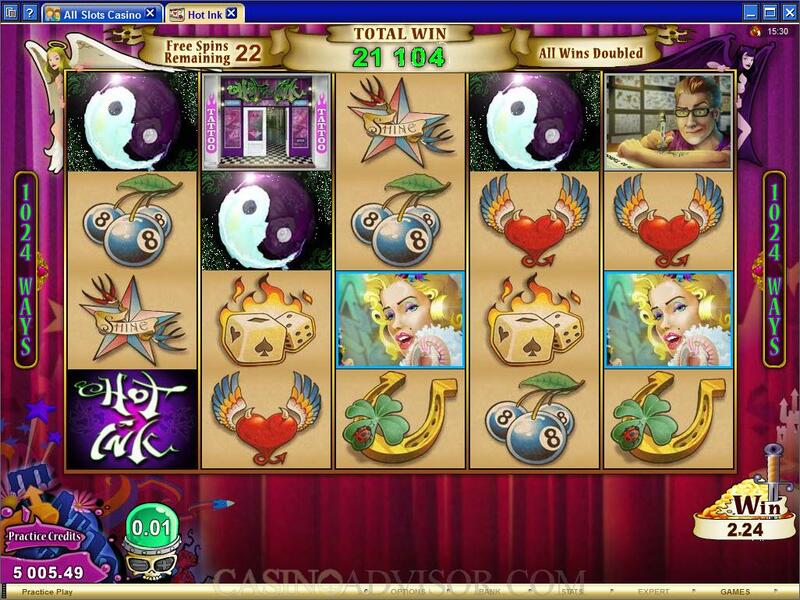 Hot Ink is a 1024 ways to win slot game. There are four rows across the reels. Like symbols appearing in any position on the reels but aligned from left to right result in payouts. Players can wager up to ten coins. These will be considered as coins per line for line payouts. The total number of coins wagered is 50 times the line bet. The coin size varies from 0.01 to 0.25. The thematic bonus feature in Hot Ink is the Tattoo Bonus. It is triggered when three or more Tattoo Logo symbols appear anywhere on the reels. The player selects one of the tattoo albums, which opens to reveal a combination of tattoos. The player gets bonus credits depending on the combination. If a complete set of combinations is revealed the player is awarded 10 free spins at doubled payouts. The feature cannot be retriggered in the free spins. The maximum amount that can be won in the Tattoo Bonus is 122,500 coins. Three Fish symbols appearing anywhere on the reels trigger the regular free spins. 20 free spins at doubled payouts are awarded. These free spins can be retriggered. The maximum amount that can be in this bonus is 100,000 coins. 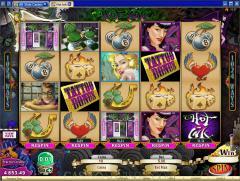 Hot Ink has another feature that was recently introduced by Microgaming. This is the Re-Spins feature. After every spin a respin value is displayed below each reel. Players can pay the amount below any one of the reels and have that reel spun again keeping all others fixed. This gives players a chance to more easily make additional winning combinations. The Re-Spins feature will not only be available after each spin but also after each respin. It will however get deactivated if the player changes the betting parameters. 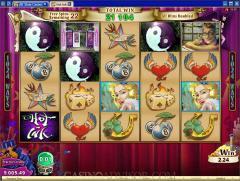 Because of so many features incorporated in Hot Ink slot game, the Hot Ink Logo is a simple wild symbol. It does not multiply payouts or does not activate any features. It does offer the highest fixed jackpot of 1,000 coins. Interested in reading more detailed information about Hot Ink? If so Click Here for more details.